No Planet B: opinion polls have long shown that young Australians are the most deeply concerned about climate change. The young have taken to the streets in peaceful protest showing governments that they too have a voice. The upcoming Australian election may prove them right, says Geoff Kitney. As the world has watched on with incredulity at the Brexit process and struggled to comprehend the way the issue has been so divisive for so long in Britain, there has been a similar story on the other side of the world. The politics of climate change have been tearing Australia apart for more than a decade and remains no closer to settlement. A general election has been called for May 18, with the conservative Coalition government facing an uphill battle to stay in office. Climate change is one of the major election issues. As with the British Conservative Party and Britain’s relationship with Europe, climate change drives a deep wedge between the right-wing and the more liberal wing of the major conservative party, the Liberal Party (which governs in coalition with the small, rural-based National Party). The right-wing conservatives have a loud voice in Australian public debate. Rupert Murdoch-owned media – he dominates Australian print media and has powerful cable media interests – give platforms to both climate change deniers and climate change sceptics. The loudest voices in Australia’s influential talk-radio sector are climate change deniers. They all give voice to sceptics and deniers in the governing conservative party and some smaller right-wing parties. As the print media-reading and television-and-radio-following public are mostly older Australians, climate change – like Brexit – is creating a generational divide. There was powerful evidence of this in the recent Australian version of rallies around the world by school children demanding action on climate change. ‘We have not only a right to protest at this political failure. We have a duty.’ Student activist, Australia. The old adages about children – that they should be seen but not heard, or that they should not speak until they are spoken to – suddenly came back to life in Australia as critics slammed the children – and their school teachers – for truanting to join protest marches. Leading the criticism was the Australian Prime Minister, Scott Morrison. A former Speaker of the Australian Parliament, Bronwyn Bishop, said Australia’s schools were creating a “generation of socialists”. A gaggle of conservative media commentators created a chorus of outrage, accusing teachers of “left-wing ideological manipulation”. Others compared it to Nazi Germany’s manipulation of young minds to create the Hitler Youth. Typical of the commentary was one who argued that kids were being used as “pawns in the climate wars”. Opinion polls have long shown that young Australians of voting age are the most deeply concerned about climate change and want governments to introduce policies to deal with it. But no-one has previously tested the views of younger people below voting age. 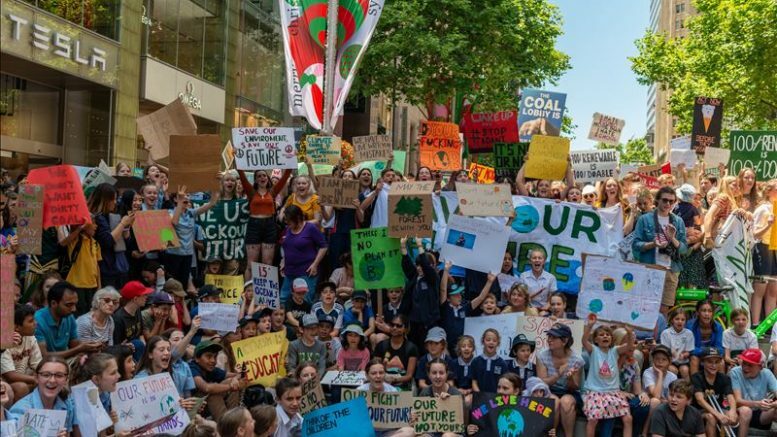 With the numbers that took part, across the country, in last week’s “strike”, it is now clear that, from an early age, young Australians are being made politically aware by the climate change issue. But in doing so, they are entering into highly charged political territory. Since the turn of the century climate change has been a hot button political issue in Australia. On a per person basis, Australia is the world’s biggest emitter of climate change gases. But as a country rich in fossil fuel resources – Australia is the world’s biggest exporter of coal and natural gas – the climate change issue has created deeply contradictory forces which have been in ferocious disagreement for many years. By acting to reduce carbon emissions – and giving weight to international climate change action – Australia risks devaluing those resources and undermining its economy, climate sceptics argue. The major resources companies – and some of the immensely wealthy owners of those businesses – are active behind the scenes, funding the opponents of climate change action. The governing Coalition – the conservative Liberal and National parties – are major beneficiaries of donations from mining interests. There is also an influential group within the conservative parties which has a strong ideological aversion to any government action to force a move away from fossil fuels to renewable energy sources. Some of the most outspoken members of these groups see the international climate action movement as a left-wing conspiracy against capitalism, with some arguing that it is, in fact, a United Nations-backed movement which has the aim of creating a worldwide socialist government. Others argue that there is little point in Australia taking action on climate change because, despite being the leading emitter per capita of climate damaging gases, Australia’s total emissions are only a tiny part of the global total and that it should not adopt economy-damaging policies until the rest of the world – particularly developing countries – do the same. The depth of hostility to mitigating policies was revealed at the start of the election campaign when the Labor Party announced that, as part of its alternative climate change plan, it would aim to have half of all new cars sold in Australia by 2030 electrically powered. The announcement brought forward a chorus of derision from the government and the Murdoch-led media commentators, warning that this would only be achieved by forcing people to sell their fossil-fuel powered vehicles and buy more expensive electric vehicles which, because of Australia’s vastness, could only be driven in the cities. In turn, the anti-electric car crowd were branded as “luddites” and accused of running an absurd, illogical scare campaign. The brutal politics of the climate change issue have been intensified in the lead up to the election by a decision by the conservative government to give the go-ahead for a vast new, open-cut coal mine in the Bowen Basin in central Queensland, despite serious concerns about its environmental impact. The project, which critics say endangers the UNESCO world heritage listed Great Barrier Reef, is owned by the Indian commodities conglomerate, Adani. Key members of the Coalition government are strong advocates for the Australian coal industry and argue that it is vital for Australia’s economic prosperity. But this election campaign follows what was Australia’s hottest summer since records began. In south-eastern Australia, the 2018-19 southern hemisphere summer average temperatures were up to 3.5 degrees centigrade above the previous record. Much of the south-east is gripped by the worst drought on record. The Murray Darling River system – Australia’s major inland river system on which huge swathes of agriculture depend – is under severe stress, in part because of poor management but also because of the long-term impacts of climate change. Young Australians who took part in the school protests insisted that, as their generation and subsequent generations will be the people who have to deal with the worsening effects of climate change, they have an absolute right – in fact a responsibility – to call for action to deal with climate change. They argue that the divisions which persist and prevent decisive action in Australia to deal with climate change threaten their future. “We have not only a right to protest at this political failure. We have a duty,” one student activist said. Polls show that climate change is one of the top five issues for voters in this election and there is little doubt that it will influence its outcome. The big read: Plant gene – turn on, tune in, or drop out? Be the first to comment on "A changing climate boosts the political divide"